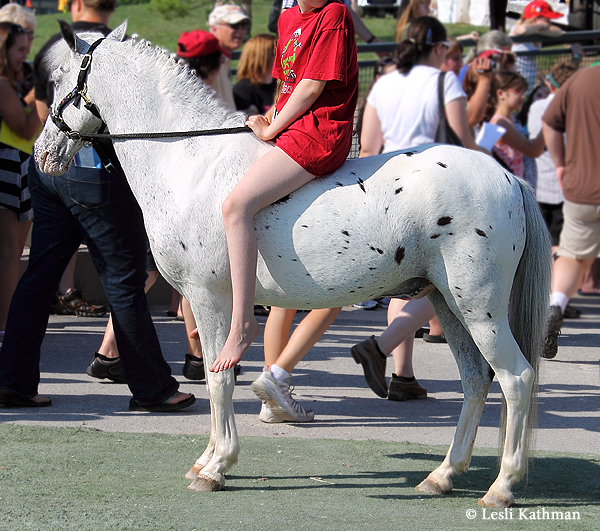 Here is one more interesting horse with pale skin, this time an appaloosa. 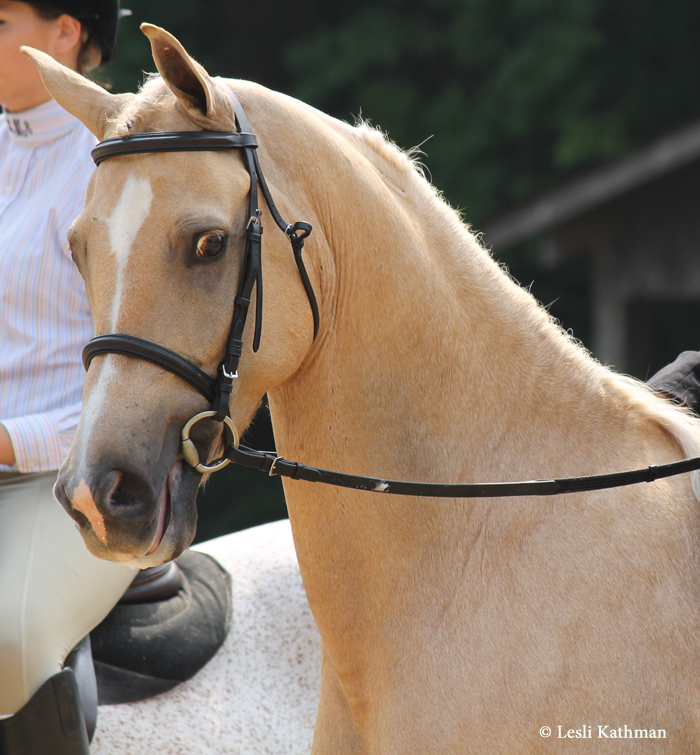 Like the amber champagne mare from a few days ago, her skin is quite consistently pink. Here is a close-up of her face. 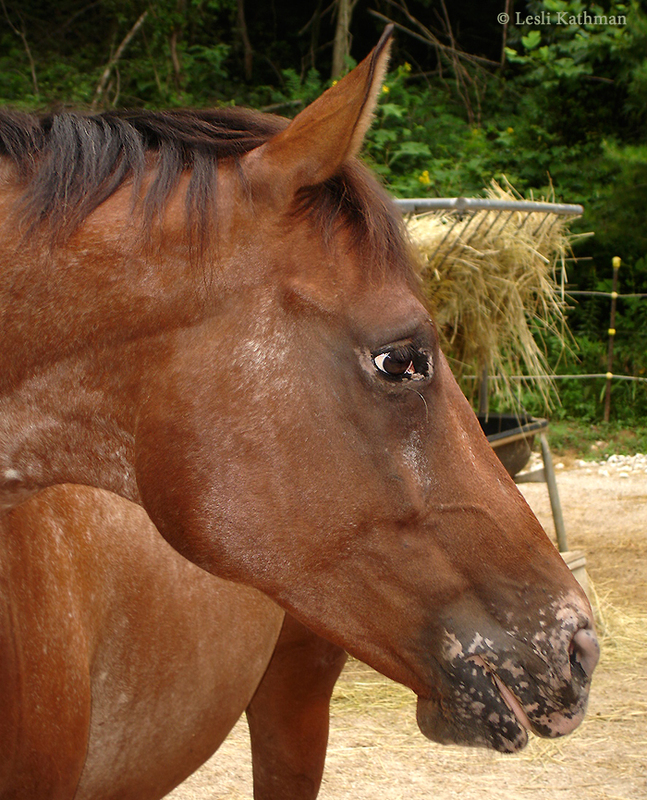 She has the small freckles often associated with champagnes, but the area behind her eye has the patchy skin coloring more typical of an appaloosa. 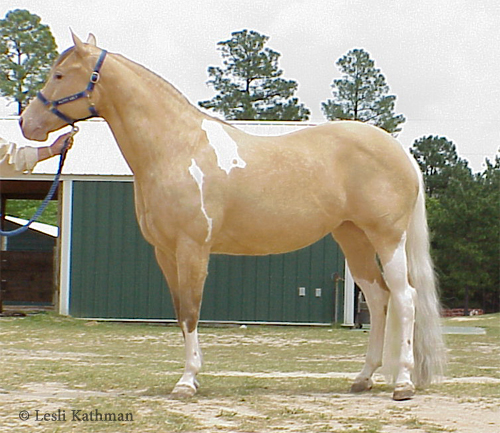 Although most appaloosas have patchy skin, rather than freckled pink skin, there are individuals that look like this mare. 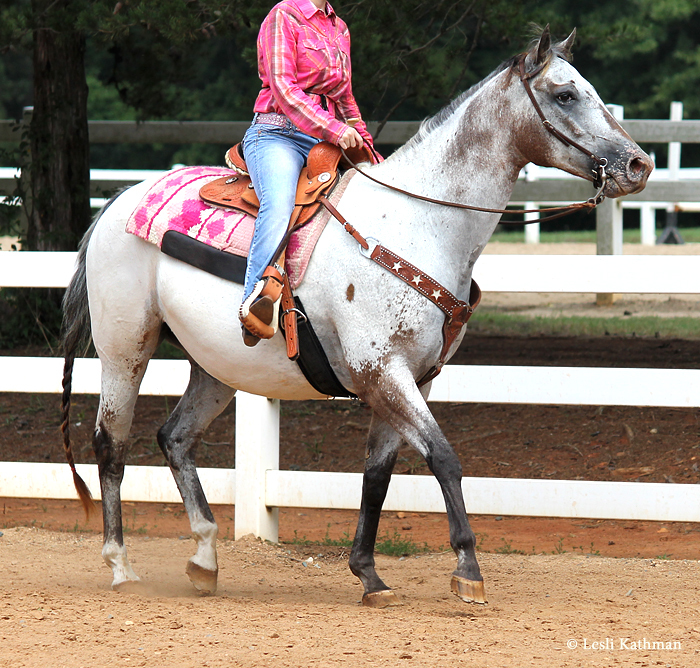 It may be that she is also a champagne as well as an appaloosa. She was squinting in almost every shot I took, and I never was able to get a good look at her eye color before she was gone. This poor photo doesn’t give a clear idea. 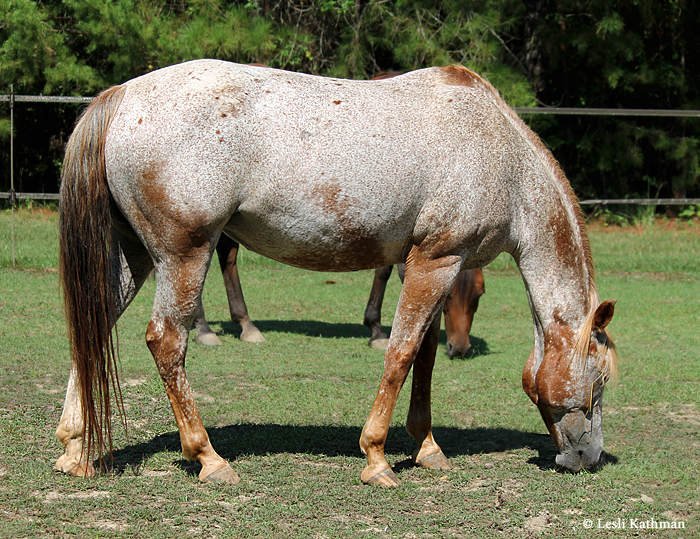 Her body color is in keeping with what might be seen on a champagne, but with the appaloosa gene influencing the appearance of her skin it is hard to be sure. 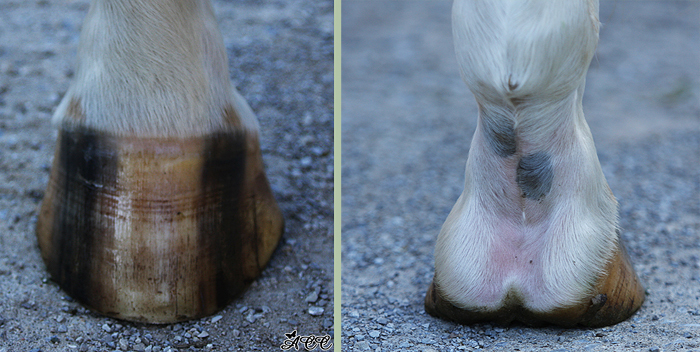 Even if she is a champagne, this kind of skin coloring can be found on appaloosas that are clearly not champagne. It isn’t really common, but it does occur. Yesterday’s post was about skin color in champagnes and cremellos. Today I wanted to share a few pictures of some palominos, to show how some of them can be mistaken for champagne. 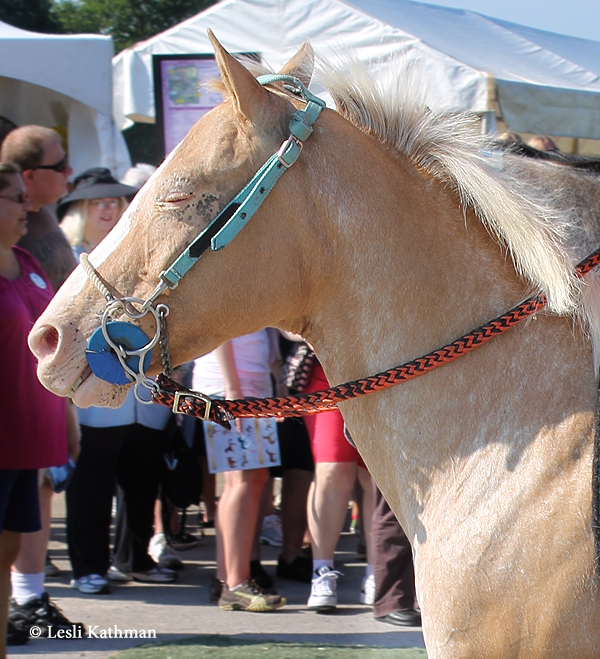 The gelding pictured above is clearly a palomino, with the very dark skin visible on his muzzle and around his eyes. Here is another picture taken in slightly different lighting, still showing the uniformly dark skin pigmentation. His skin is uniformly dark – on his face. But this is a shot taken of the area under his tail. The skin here has a purple tone. It is not fully pigmented like his face. He is sweaty in this picture, so the skin actually appears somewhat darker than it is. Here is another shot showing his sheath and inner thigh, which have the same incomplete pigmentation. 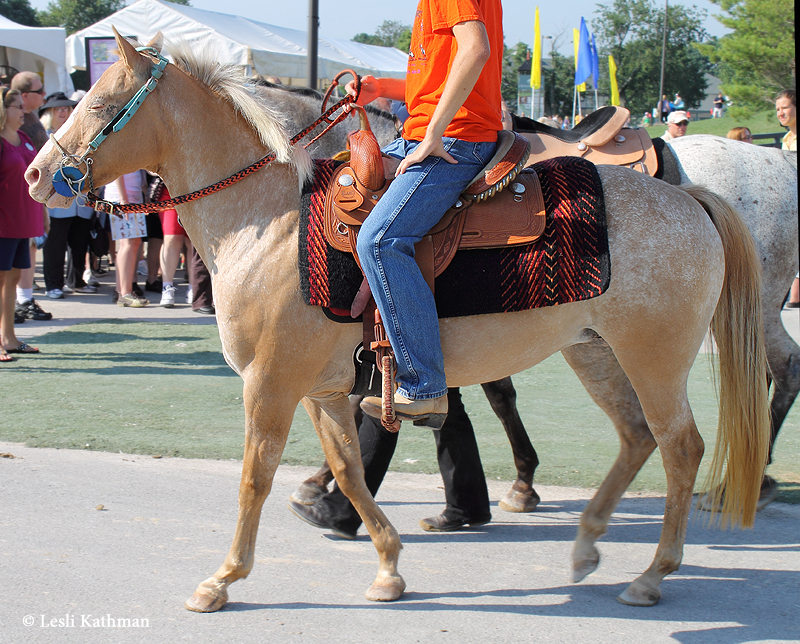 In my experience, this kind of skin coloring is not uncommon in palominos. This guy is actually on the moderate range. I have seen individuals with much less pigment. The give away that the horses are in fact palominos is the dark face skin, though face markings on some pintos can obscure that clue. Dark skin is visible on the muzzle spots on his guy, as well as around his eyes (just barely visible in the photo I took). It isn’t hard to imagine a Paint with markings that would cover those clues, though. Here is the underside of that same Paint. It is not surprising that many find the identification of champagnes difficult, given that pinkish skin can be found on the undersides of many palominos. 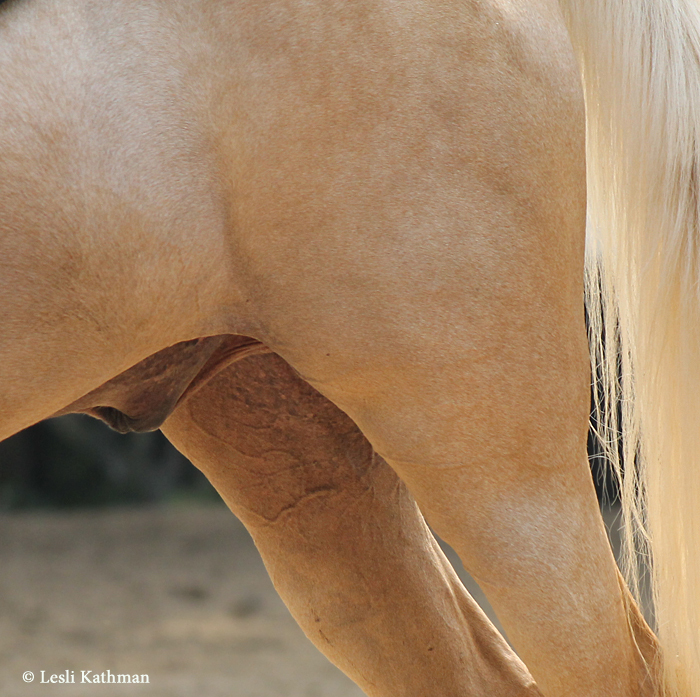 This can also explain why early palomino breeders believed that loss of pigmentation was a progressive thing brought on by breeding palominos together over generations. They were, in fact, breeding both cream and champagne dilutes. The various combinations of those two dilutions, along with the individual variations, could give the visual impression of varying degrees of diluting all three things – skin, eyes and coat color. Most modern horsemen are aware that champagne is a separate color, and many are getting better at identifying it thanks to websites with comparison shots like the ICHR site linked yesterday. Still the differences can be pretty subtle. 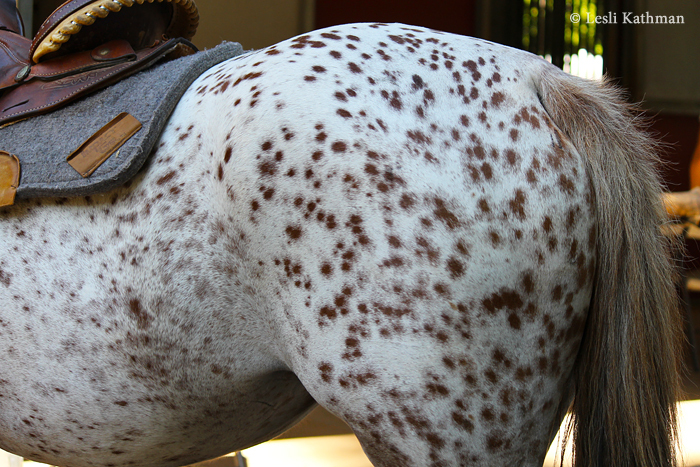 The champagne registry prefers the term freckling when describing the skin tone of their horses, to differentiate it from the mottling associated with the appaloosa patterns. As an artist, I think of the skin color on an older champagne – one that has begun to deepen in color – as looking a great deal like pointillism. That is, the darker color is applied in tiny, overlapping dots on a pinkish base. Abundant freckles seems like a good description. 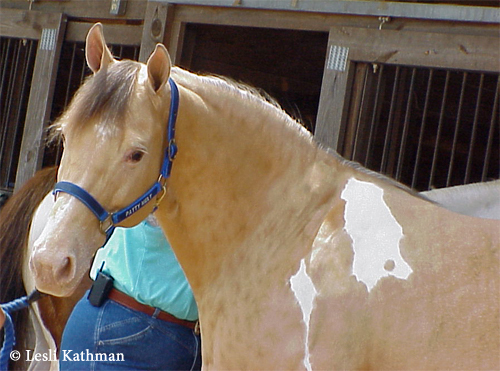 Appaloosa mottling looks more like patches of color (dark or light) placed on top of the other. The lighter skin on the undersides of some palominos tends to look like soft washes of dark color dabbed on, but the artist never finished getting the dark pigment fulling applied. Unlike the champagne, there aren’t distinct freckles, although there are softer-edged spots of darker coloring. Unfortunately there isn’t really a good word for that effect. Another subtle difference between champagne skin and pink skin on palominos is that the extremities in one tend towards pink (champagne) and the other towards dark (palomino). In the linked ICHR article, the example used is mare udders. In champagnes, the teats are pink, whereas with palominos those are dark. 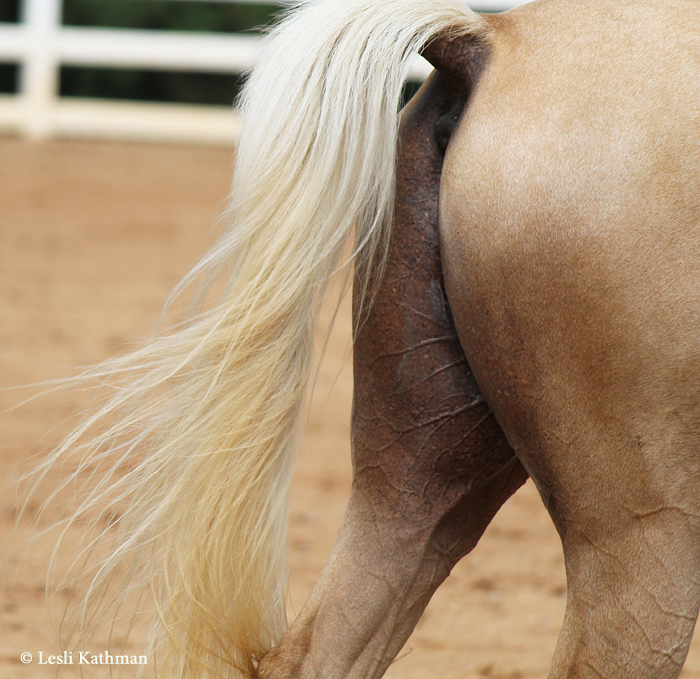 This is what helps to give the impression that a champagne is a pink-skinned animal that had dark pigmented added, while a palomino is a dark-skinned animal that had pigment taken away. In the last few years, a few cremellos have been noted as having darker skin than might be expected. 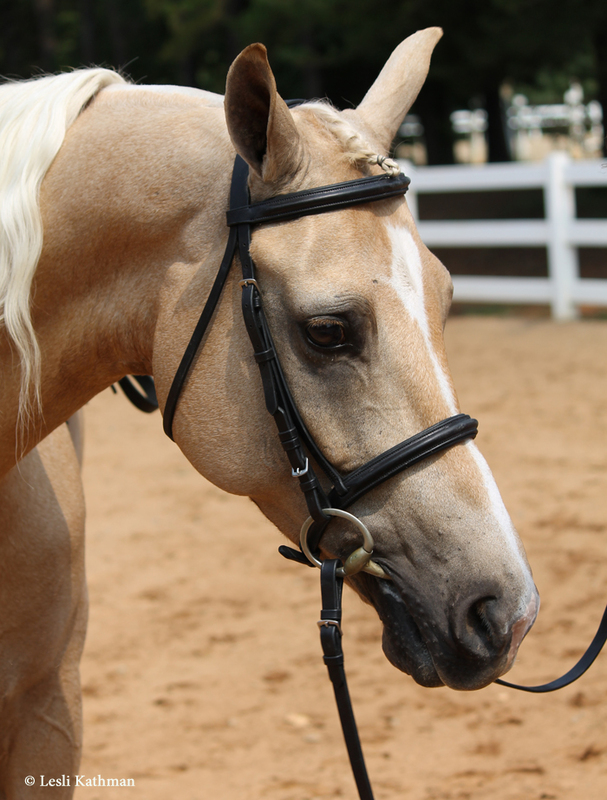 One of the first to gain widespread attention was the Morgan stallion Amberfields Desperado. Although many observers insisted that he could not possibly be a cremello with such dark skin and green eyes, his breeding record said that was exactly what he was. Another was the Quarter Horse stallion Peptocremzemal. When his dark skin caused some to question the validity of his tests, his owner took the step of having a test done by a second lab to prove that he really was a cremello. 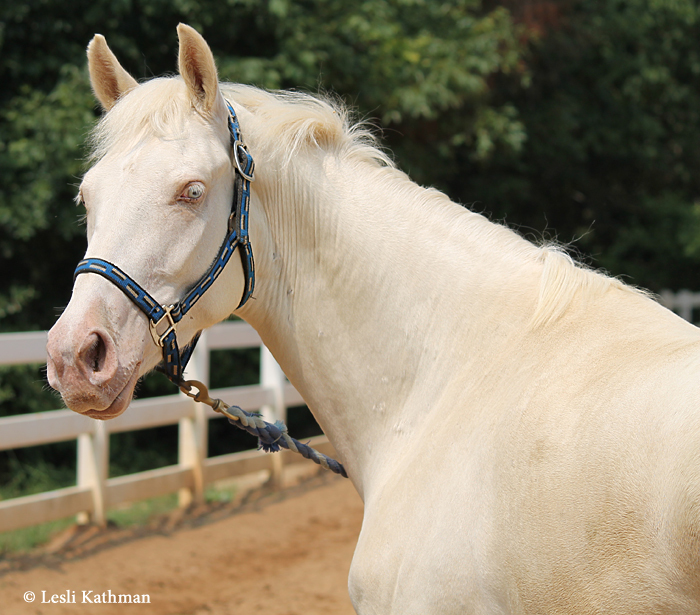 Cases like these have made it clear that while general rules about skin color are helpful for identifying most horses, there are individuals that deviate from the norm. 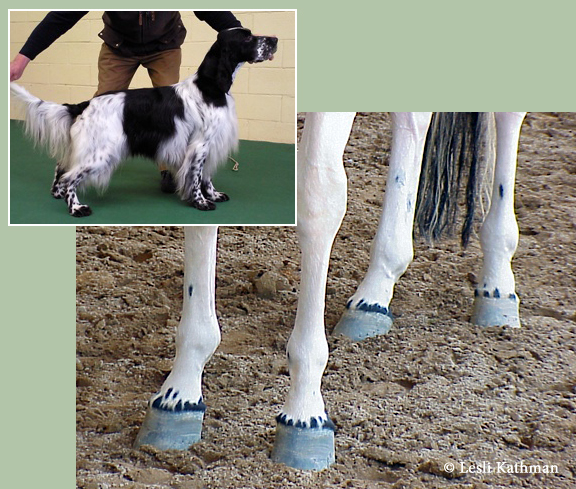 The horse in the top picture is another with somewhat atypical skin coloring. 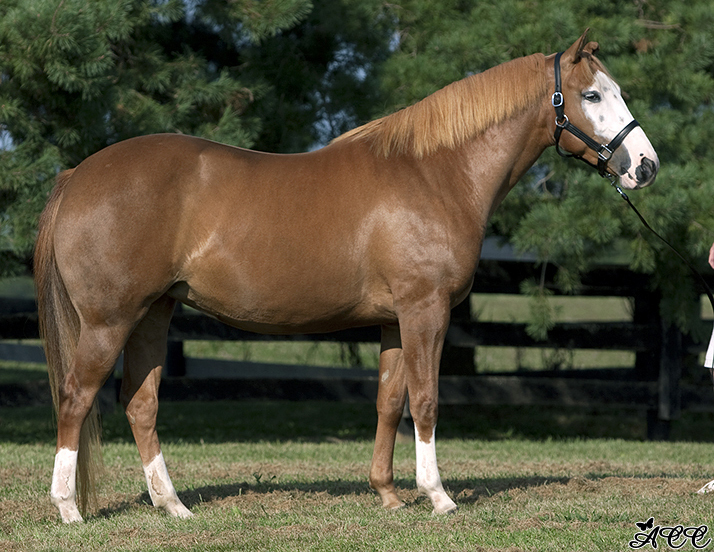 She is an amber champagne (bay with the champagne dilution) tobiano Paint. Here is a full-body shot of her. And here is a shot that shows her reversed dappling. 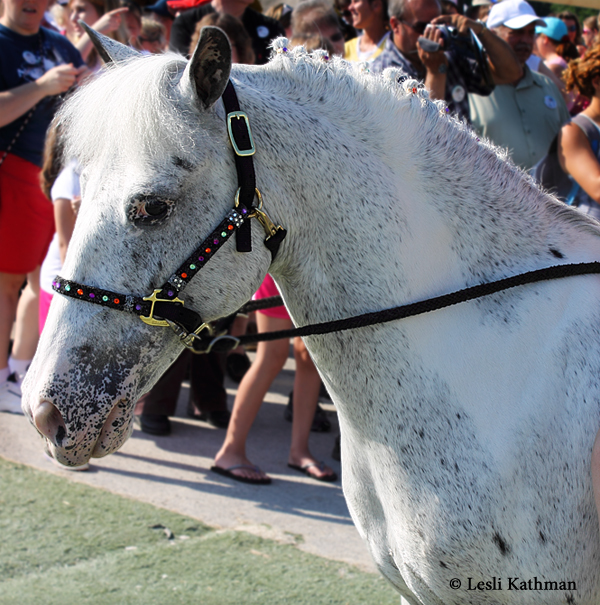 She had the metallic sheen seen on a lot of champagnes, so the dapples were hard to capture on film. In person they were even more pronounced. The photos were taken back when champagne was only just beginning to be understood, so it didn’t register with me at the time that her skin – particularly her muzzle – was unusually pink for an older champagne. She was thirteen, which is long enough that most horses would have developed the “abundant dark freckles” associated with champagne. (For some great comparison shots of typical champagnes and other dilutions, this guide published by the International Champagne Horse Registry is an excellent resource.) For some reason, her skin was still pretty pale and free of extensive freckling. 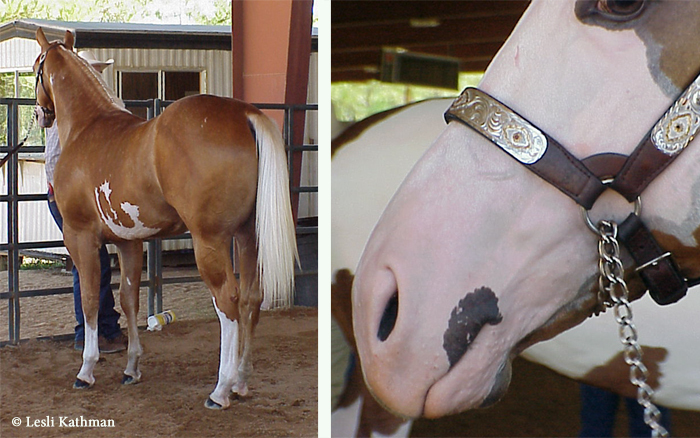 Horses like this that do not follow the rules do make identification difficult, especially when the differences between the dilutions are already subtle, as least to the average horseman. After all, how different are these two noses? 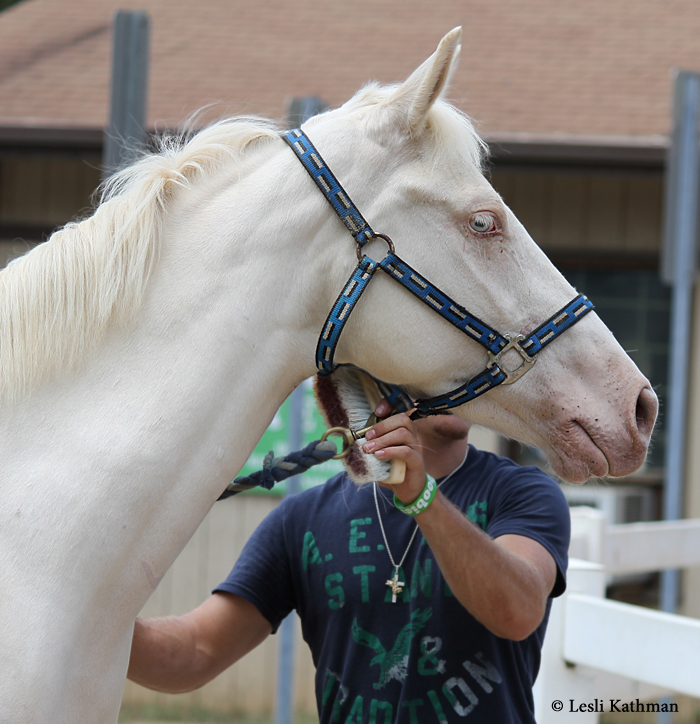 That second nose belongs to this cremello filly. Here is another shot that better shows the freckling on her skin. It is even more pronounced under her tail. 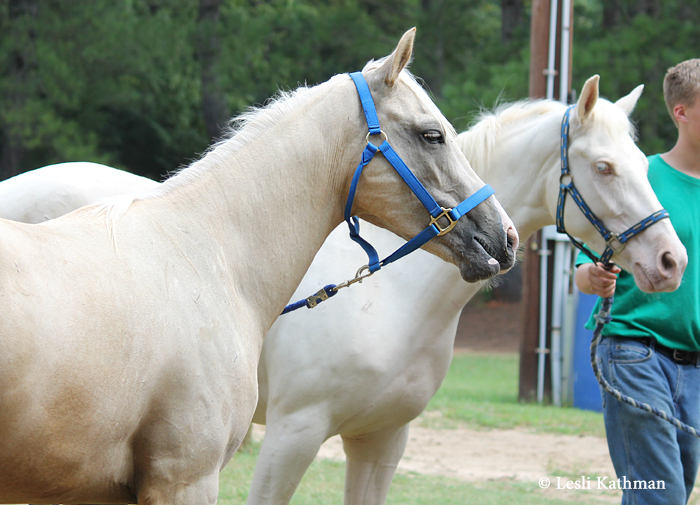 Here she is with her very pale palomino half-brother. 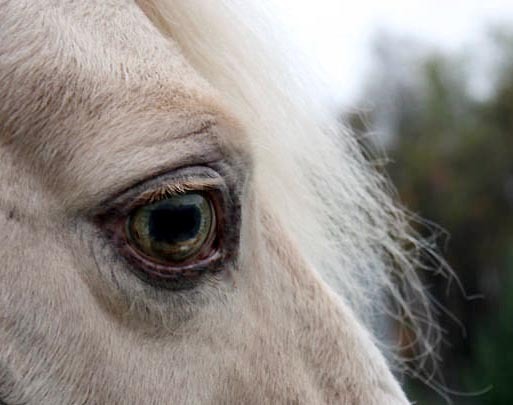 Before there were tests for cream and champagne (and for the more recently identified pearl), the only real way to be sure with horses like these was to look at the colors of the relatives and – if the horse had been used for breeding – offspring. The champagne mare at the top does have champagne siblings, including a younger sister that is officially registered as a gold champagne. Now tests can clear up questions about what a given horse carries, which may help those interested in color identification define the full range of what is possible within each color. 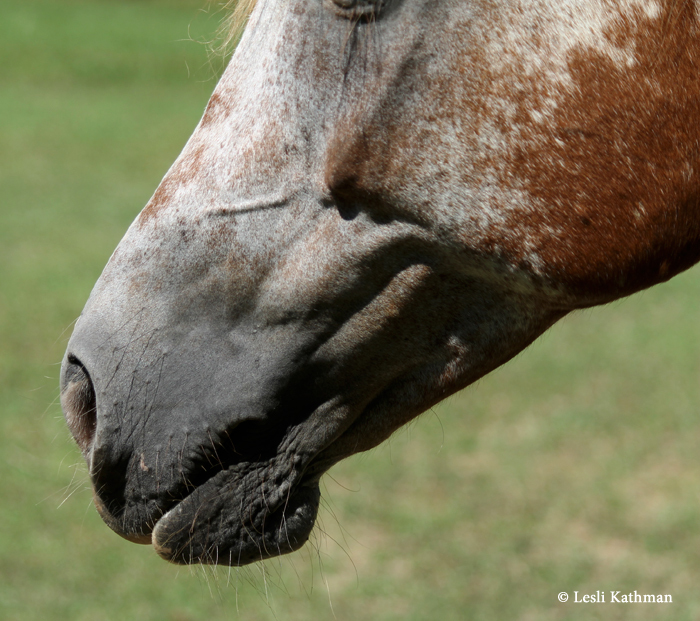 Earlier this week I posted some examples of appaloosa facial mottling. I have a few more examples today. In each case I’ve tried to get a good full-body profile shot and then a close-up of the muzzle and, if they have any mottling, the eyes. 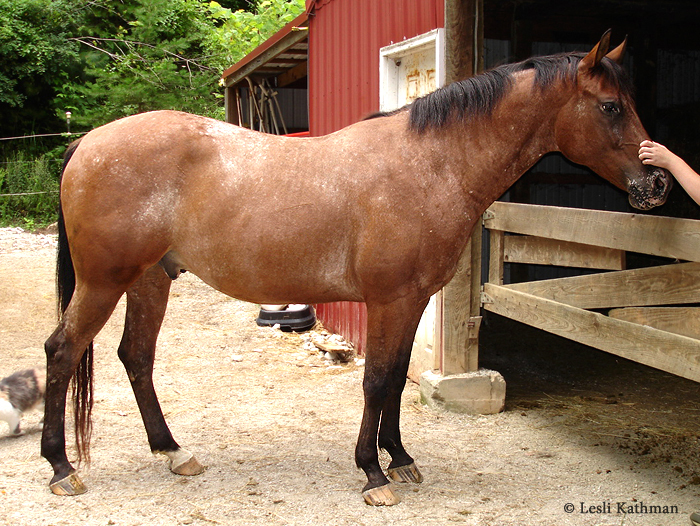 The horse above is another chestnut varnish roan not that different from Freckles, the mare in the original post. Like her he is also in his teens. He also has very little in the way of mottling. The pink areas on his muzzle are markings. 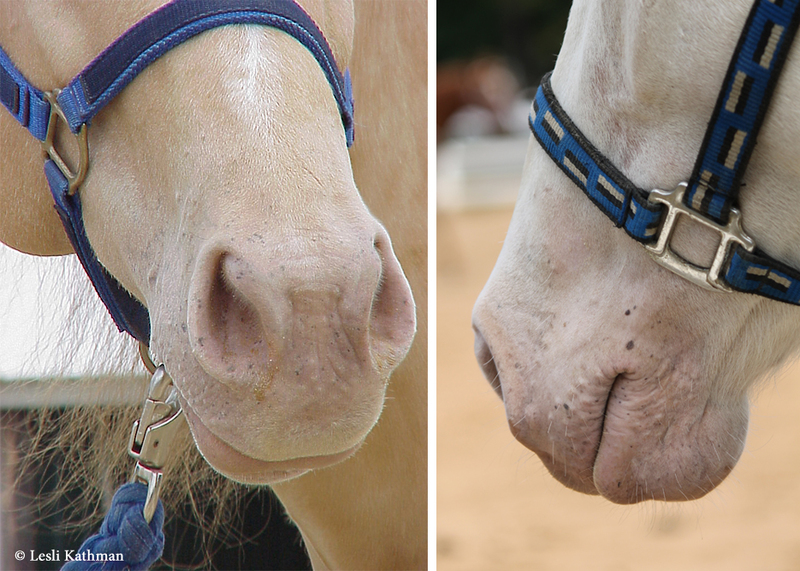 To find any mottling at all, his lips have to be pulled back much like I did with the pony Thumper. Looking at this guy and at Freckles, it might be temping to assume that varnish roan appaloosas, which are appaloosas without a pattern to go with the varnish gene, aren’t inclined to mottling. Yet this guy has an even less extensive pattern than either of the two previous varnish roans. 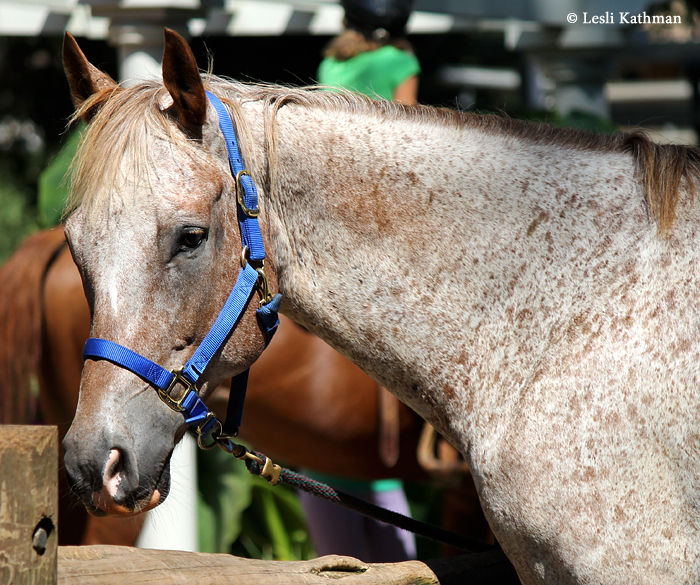 I suspect that part of the reason he has such pronounced mottling is that he is probably a homozygous appaloosa. That can be hard to tell with varnish-only appaloosas, because aren’t patterned spots to remove like with a leopard or a blanket. 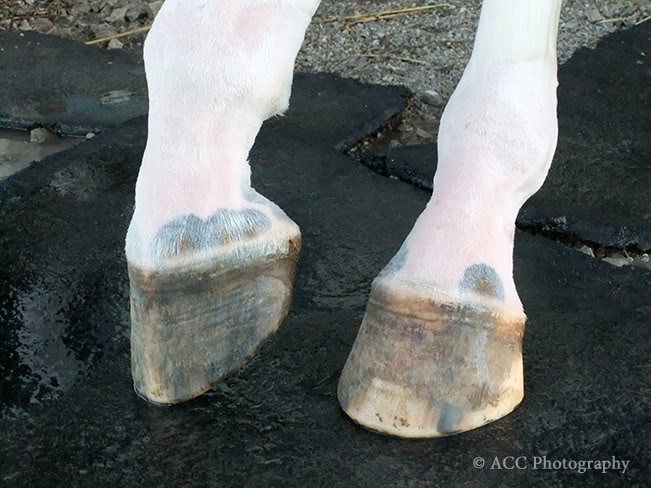 What he does have is the extensive mottling and the pale hooves. 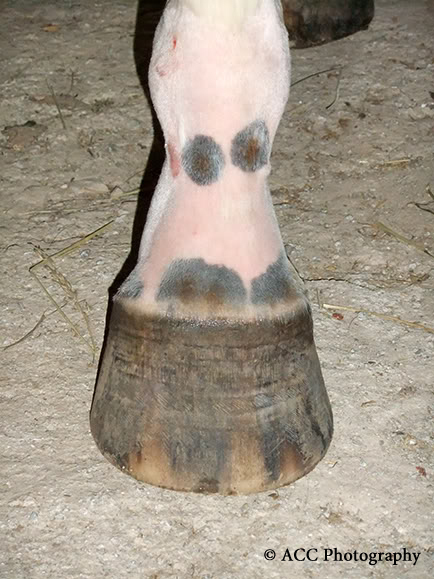 Usually a black leg on an appaloosa has an overall dark look, but this guy has predominantly shell-colored hooves. His mottling even includes his eyes. I have found that to be a lot more common in homozygous appaloosas than in heterozygous ones. Some of that may be selection, though. 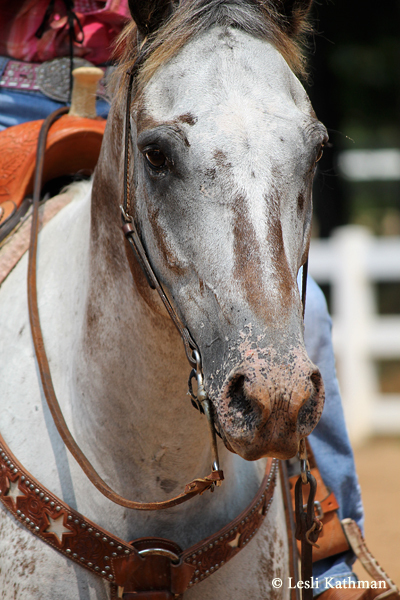 Appaloosa breeders have tended to prefer dark skin around the eyes, and so have selected for less mottling in general and less mottling around the yes in particular. Yet Dottie has a lot of mottling on her muzzle. I suspect that part of the reason her nose is pink is that there is a white marking there, since mottling does not usually create that much pink on one spot. Even allowing for the fact that she probably has a large snip, she still has a lot of mottling. The area around her eyes is dark, though. 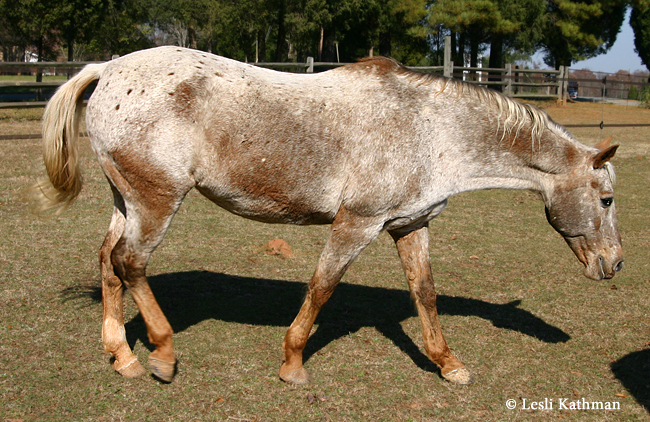 This pintaloosa that appeared in an earlier post is another heterozygous appaloosa with a lot of mottling. Not only is it visible around his mouth and eyes, but even the area inside his ears is mottled. 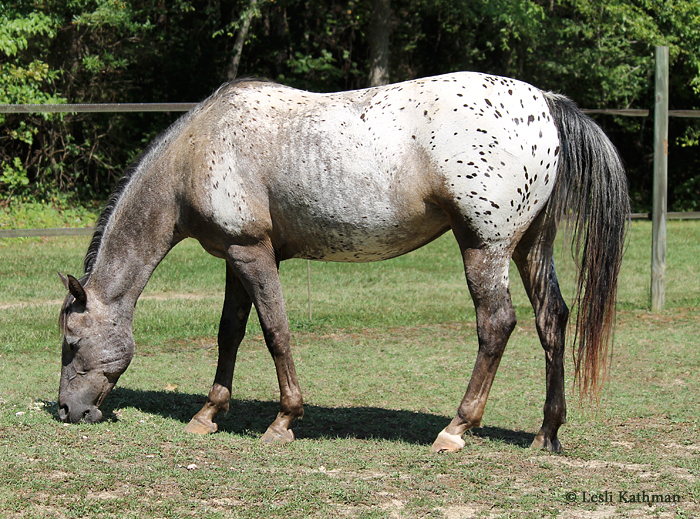 Moving back to the other extreme, here is a very loudly patterned appaloosa with almost no mottling at all. His spots say he is heterozygous, and the white area on his hindquarters (and the size of his spots) say he has the blanket pattern. He is in his twenties, so his varnish pattern – and his mottling – have probably progressed as much as they are going to go. 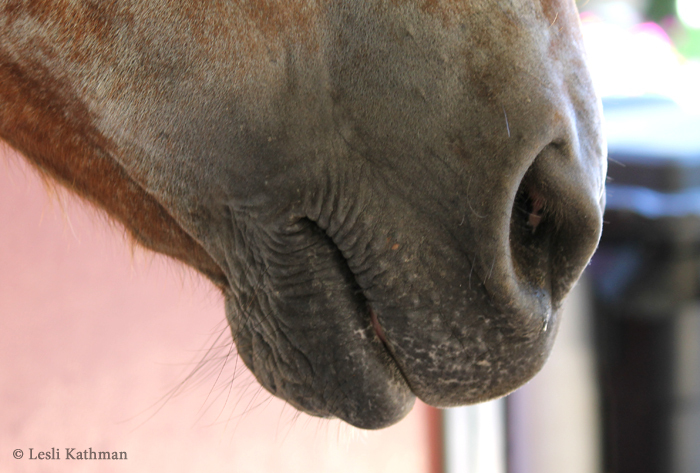 Here is a close-up of his muzzle. If you look closely, he has a faint network of paler skin close to his mouth. And finally here is Abby. She is another varnish-only appaloosa. Like Commanche, the horse above, she was also in her twenties when this picture was taken.She is also in winter coat, so she’s slightly darker than usual. She does have some mottling, though it’s not nearly as pronounced as the homozygous varnish. As these pictures show, mottling on appaloosas covers a pretty wide range. It does not appear to be specifically linked to the presence or absence of patterns like blanket or leopard, but it does seem to be more pronounced in homozygous appaloosas. There are also probably other minor modifiers that are involved, some of which have likely been inadvertently selected in breeder’s preferences for darker skin. After posting the images of the mottled skin of the grey, I thought it might be interesting to post some appaloosas to show the range of mottling seen on their faces. 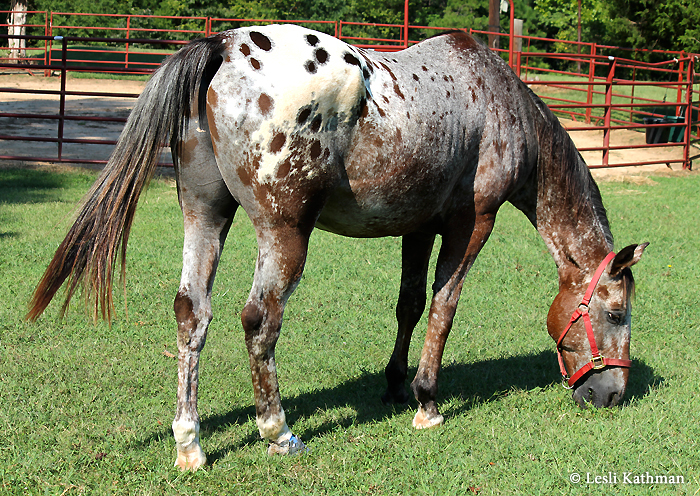 Appaloosa mottling is something that tends to develop with age, but it is also something that varies a great deal from one individual appaloosa to the next. This first picture is of one of my mare’s pasture mates, Freckles. She is a chestnut varnish roan with a blaze and one hind stocking, and is in her early teens. In the four years I have known her, her color has not changed in any significant way. Her unmarked feet are striped and the area under her tail is mottled, but she has almost no facial mottling. 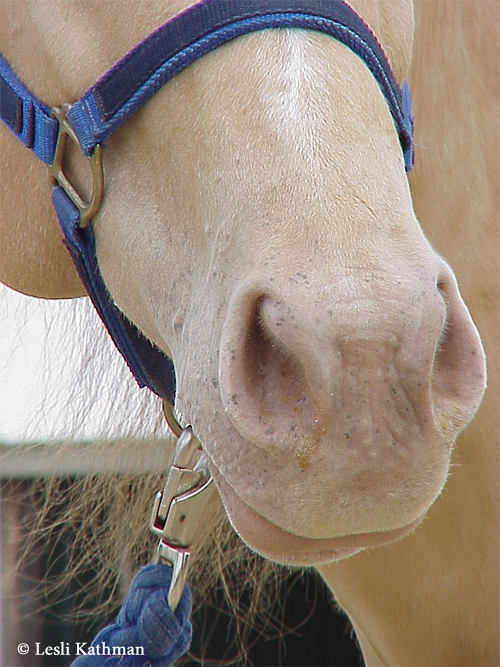 The pink areas around her nostril and lips are from her blaze. The rest shows almost no mottling unless you pull her lips back. This is my own mare Sprinkles. She’s a suppressed leopard, so she has a pattern as well as the varnish roan gene. 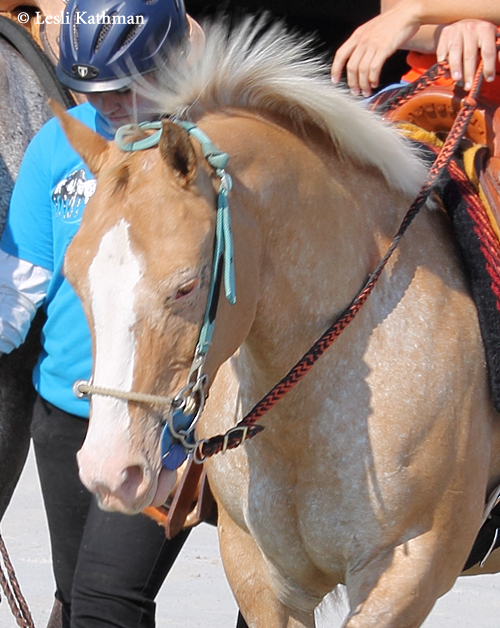 Her color has been changing as she roans out, but overall the progress has been quite slow. She is eight years old in this picture. She did not have much mottling on her mouth when I purchased her at three. She’s been getting more in the last few years, but it is mostly around the edges of her lips. Just how visible it is depends on how she is holding her mouth. 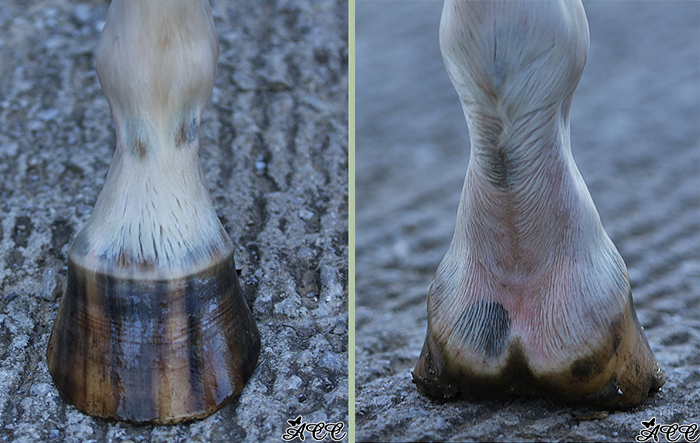 The mottling on the front edge of her muzzle visible in the first picture is actually the edge of her blaze. Like a lot of appaloosas – and greys – the mottling borders the part of her blaze the covers the front of her nose. 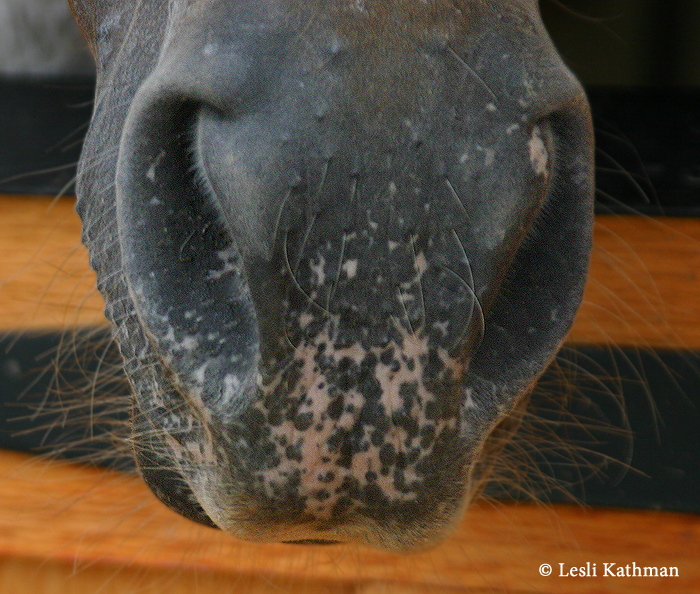 That was the first part of her muzzle to show mottling as a young horse. Homozygous appaloosas (fewspots and snowcaps) often have more pronounced mottling than heterozygous appaloosas. He certainly has more than either Sprinkles or Freckles. If you look closely at the enlarged version of this photo, you might be able to make out star on his forehead and the pink mottled skin around it. He also shows the classic dark “V” across the nasal bones that many varnish roans have. Note: I recommend clicking on all the photos in this post, since that takes you to larger images that don’t have distortion from the compression. 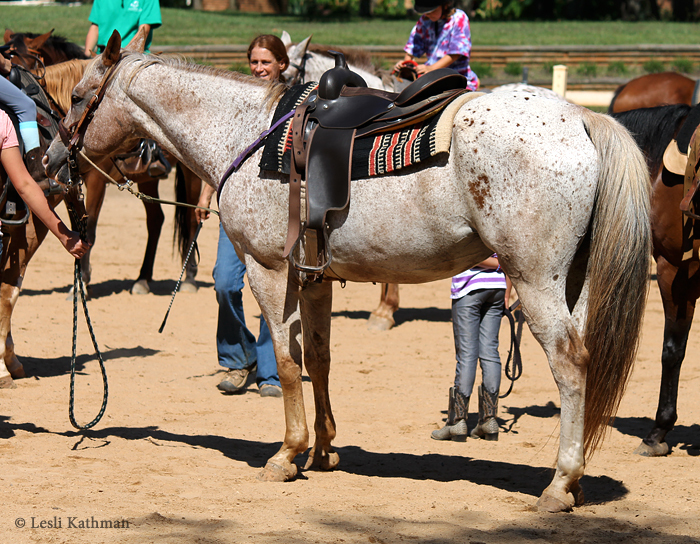 In the comments section of the previous post, Jo-Ann Ferre mentioned mottling on non-greys, which is also unrelated to appaloosa patterning. 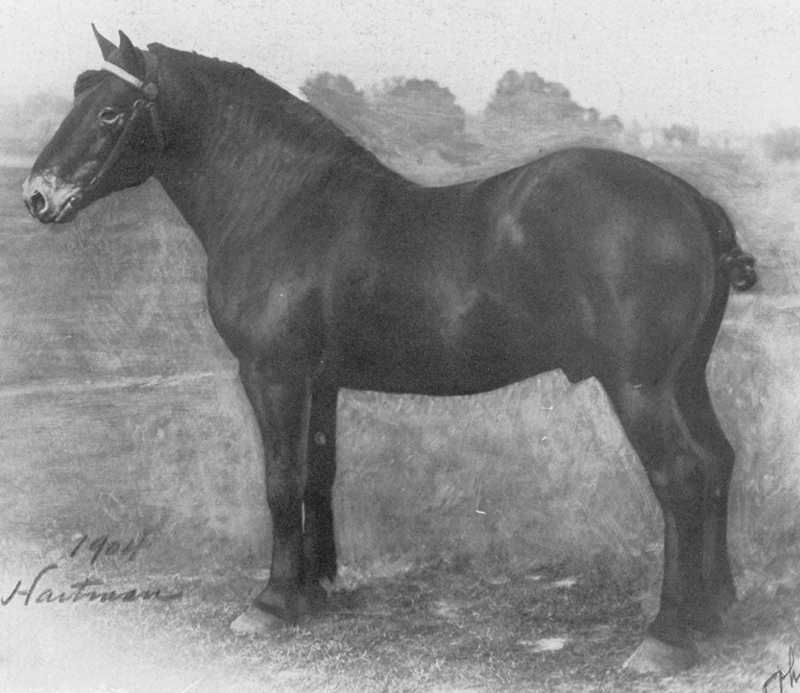 That reminded me of one of the pictures in the upcoming book, of the early 20th century Percheron stallion Keror. He was a prize winner in his day, despite the extensive loss of pigment on his face. I’ve seen this on a wide variety of breeds, but whatever the cause it does not seem to run in families or be passed along to offspring. Perhaps that is why breeders have been willing to use stallions like this in years past. I also apologize for the delay in posts and in replies to private questions. I am slogging through what I hope are the last revisions to the book, so that is consuming the lion’s share of my attention. I should be back to more regular posting in a few days.